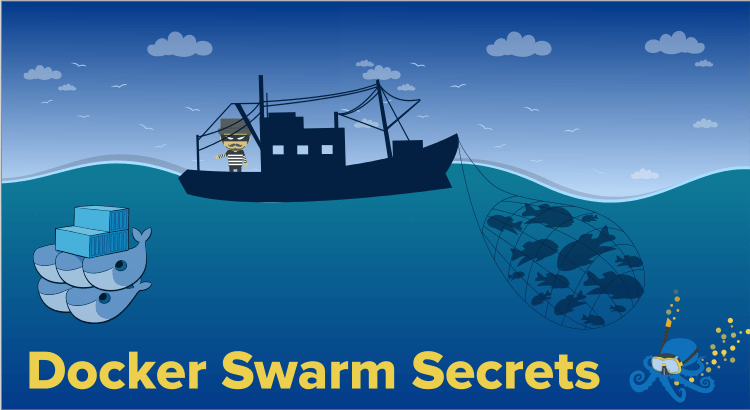 This post shows how to use Docker Secrets in Docker Swarm mode. For our example we’ll show how to use Docker Secrets to encrypt and safely store tokens used by Sematext Docker Agent for shipping Docker metrics and logs. Before we start, check out this useful Docker Cheatsheet. Containerized applications often require access to sensitive data like SSL keys, login credentials or access tokens. Containers are commonly configured via environment variables, docker-compose or configuration files stored on unencrypted volumes. While nice and simple, this approach has a major security hole – a simple “docker inspect” command would expose passwords or tokens configured in clear text via environment variables. Docker engine 1.13 introduced the management of secrets for Docker Swarm mode. Docker manages secrets as a blob in the internal Raft store. This means secrets get the same high availability guarantees that the the rest of the Swarm management data gets. Secrets are encrypted using NACL’s Salsa20Poly1305 with a 256-bit key. Volumes with secrets can be mounted at runtime with the new docker service create --secret <secret-name> option. Containers can access /run/secrets/<secret-name> to access the file. It turns out this new feature helps not only with encryption and distribution of sensitive files, but can also be used as a switch between different configurations, e.g. to apply different configurations for staging or production, just by changing the --secret <secret-name> parameter. As Docker Ecosystem Partner we are committed to supporting new Docker features in Sematext Docker Agent (SDA) for container monitoring and log management. We introduced support for Docker Secrets in version 1.31.19 released in March 2017, which means that your Sematext Docker Agent configuration could be managed via Docker secrets command. Get started in under 15 min with 1 “docker run …”. As simple as that! Let’s see how to deploy Sematext Docker to monitor a Swarm cluster using the new secrets feature in 3 simple steps. The configuration file content could include all options, normally passed via -e (Environment) parameter to docker run or docker service create commands. Note: The Logsene token is the most sensitive bit of information here because it allow writing and reading of logs. Logsene lets you create write-only tokens and we recommend using them for log shipping. The docker secret create command creates the encrypted blob which will be available in /run/secrets/sematext-agent at container runtime. After pulling the image Sematext Docker Agent will start, using the configuration from secrets. You are 1 “docker run …” command away from correlating your Docker metrics & logs. We hope this short post helped explain how to keep secrets with Docker Secret and how to improve the security of your Docker monitoring and logging deployments with Sematext Docker Agent. Don’t forget to download the Cheat Sheet you need. If have any question get in touch with us via comments, live chat, @sematext on Twitter or check out Sematext Docker Agent on Github.